When doing a Google Search for the latest billboard ads I found this page on google - fame at last! is pictured here holding a copy of his scintillating biography which is jam-packed with the adventure that is his life and all his good works. One also gets to know his ancestral history which is many and varied from the deserts of Kalahari to that special place - Meerkovo which has its own web-site.. 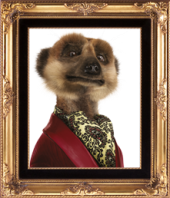 Handsome, talented and stylish aristocrat founder of comparethemeerkat.com, when not comparing meerkats he is try to teach fur brained peoples the difference between meerkat and market. 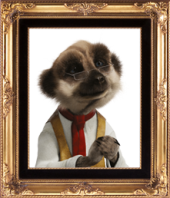 What can be said about Sergei… he is head of IT, one of Aleksandr's oldest friends and… is moulting. He was once the head of ‘Meer’ space station project but he left to get dream job at comparethemeerkat.com. Rumours that he was fired are untrue. The beautiful Maiya is the teacher in Meerkovo primary school. 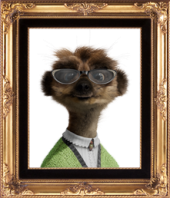 Many pups were receive excellent grades thanks to her, but since comparethemeerkat.com clogged she has found it difficult to maintain control over the class. Yakov is an elder of the village. He is quiet and shy and prefer to be alone at his workbench than out and about. Yakov sharp as a whip and very wise… but not very good at Meeropoly. Vassily is run a record store in Meerkovo. He plays bass and used to roadie for Iron Meerkat back in the 80’s but now he spends most of his day selling bubble-gum pop records to meerpups. 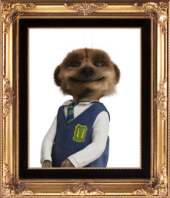 Bogdan is a local pup who studies at Meerkovo primary. Since his favourite website crash with people looking for insurance he has started to act naughty and get bad grades. Bogdan also holds record for longest time under dunce cap. Baby Oleg has his own special blog! This is Oleg toy you can adopt by demonstrate you know the difference. He will arrive on your doorstep in moses basket just like he did on mine. He will be as cute as the real Oleg but be 153% less messy and loud. He will be wear designer bug pattern baby grow with fresh nappy underneath perfectly fitted by Sergei. He will also come completes with his favourite toy 'Mr Grub' to help him (and you) sleep at night time. 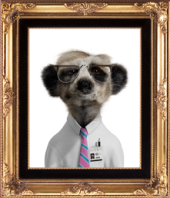 Oleg is our most beloved meerpup. He is curious and always want to discover new places. Is why he was so excited for live in Africa with other safari meerpups. He is sociable and he play in the sun all day with best friend, Ayana. He already catch beetles with his own little paws, but he still has a lot to learn about life in Africa from her. Oleg loves film Disney Frozen, and so he dream about snowy place where he is dress up as favourite character, Olaf. Like the snowman, he is full of energy and ready to have fun with Ayana. Best Friend: Ayana Favourite Food: Beetle bits. Ayana is little meerpup who live with baby Oleg in African village. She has big, cute eyes, but don't be fool by that; she can be mischievous and up for shenanigans. Oleg is tell me how they catch bugs together and race each other around village. She is help him with culture difference, and he is tell her stories about life in Meerkovo. Her favourite Disney Frozen Character is Elsa. She look even more adorables in blue princess dress. She may not have real ice powers, but she is very likely to melt your heart. We love Sergei and Bohdan and all the Meerpups! Here is Sergei, tussling with a dog, bravely saving the Aleksandr toy from being ripped to pieces! And then there were the Billboards! Luckily we have now found the beautiful Maiya (Detention Slips Not Included) on two billboards in Sneinton practically next to each other! I know - Bogdan again, but this time our own photo also in Sneinton! The hunt is on for Yakov (saw one outside the railway station, but didn't have camera with me and when we went there a couple of days later he had gone! ), Vassily and Aleksandr himself. We found 'bad boy' Vassily 'with extra bad attitude' although the lighting is not doing him any favours! - But Yakov was terribly shy and did not re-appear. 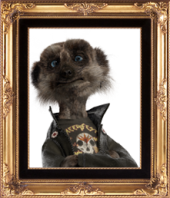 Aleksandr, also would not favour us with an appearance. As for the prices the toys are selling at on ebay - it's OMG time! Second Wave of Billboard Advertising - even better! Vassily was missing for a long time so he gets second billing despite coming with 'guitar not included'! Poor Sergei what he has to put up with and the ironing board isn't even included! And this time Bogdan comes without 'bogies'!